Could one ask for a better slope for one's return to skiing after eight years, accompanied by two children aged 12 and 13? The photo above was taken just before midday on Friday, 23 January. Eddie is just about visible before the bend in the piste, Sabina a little way behind. No one else in view! The piste was perfectly prepared (just a touch icy on our first few runs), by the afternoon conditions were absolutely ideal. Very, very few people. This is the advantage of Poland's staggered half-term system, whereby only a quarter of Poland found itself on holiday this week. 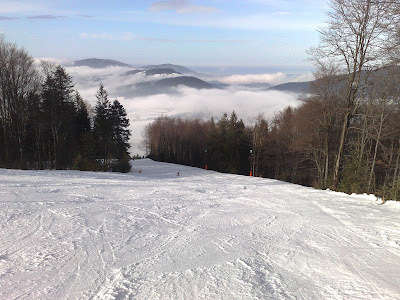 The Beskid Wyspowy, being virtually unknown to Warsaw-based skiers, was the place to be (while Zakopane and surrounding resorts in the Tatras) were packed. By the way, the photo shows well why the region is so named (the Island Beskids) - the peaks stick out above the fog like islands out of the sea. This one-run slope, for those interested, is at Kasina Wielka, and goes up Śnieżnica (just over 1,000m at the summit, though the run starts at 900m). The run is an easy red, 1.4km long, broad and evenly sloped. Click here for virtual 360 degree views of the piste (from bottom to top). Criticisms - well, only the one slope, so zero variety. The lift pass, 50 zlotys for five hours (around 11 quid) seems expensive compared to Alpine resorts with a multiplicity of runs. And height. Although the word 'mountain' suggests a steeply-sloped hill with a definable peak and a height of over 600m above sea level, I would add the following definition. "A mountain is land mass situated sufficiently high that any winter precipitation falls on it as snow, not as rain'. There's nothing more miserable for skiers than skiing in rain. That's what we did on Wednesday afternoon, we came off the slope an hour early. It reminded me of my previous ski trip in Poland, to Szczyrk in 2000, when it rained so intensively that my ski-suit was sodden and my expensive Minolta TC-1 camera broke (and put me off Poland for skiing for years). 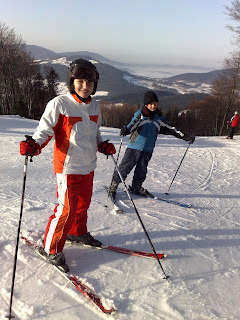 However, the other days of excellent, uncrowded skiing on Śnieżyca more than made up for a few rainy runs on Wednesday. I recommend Śnieżyca for intermediate-level family skiing. Right: Two happy young skiers - Sabina and Eddie. Photo taken at two pm - still the slope remains almost empty. Ideal to get one's form back. Remember: weight on ze down'eel ski, face ze bottom of ze slope wiz your shoulders, press ze shinbones on ze front of ze boots, bend ze knees, plant ze pole, pivot around eet, compression - extention, swing-swing-swing! By Friday I was doing it right, remembering all those lessons from years gone by.